Technology is often used to solve common challenges. At UPMC Bedford Memorial, new technology is keeping everyone current on patient status, from the staff to family members in waiting rooms. Called SurgiNet, the system displays patient status at monitors spread throughout the hospital’s waiting rooms and nursing stations. Patients are given an ID number to share at their discretion. The system only displays ID numbers to protect each patient’s privacy, but it allows visitors to know, for example, when a surgery has started. Mobile stations, shown at left in photo above, allow immediate communication to all of the SurgiNet monitors. For hospital visitors, the technology is unobtrusive, easily understood, and requires no training, yet it speeds communication throughout the hospital. Computing and communications technology is changing the way we live and work. Today’s iPhones and Blackberries are really ultraportable computers allowing us to be in contact, receive and send emails, and access the internet and our business networks from virtually anywhere. 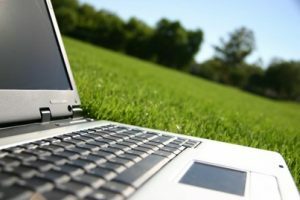 Ease of communicating allows a business to locate anywhere they can get broadband. As computer speeds have reached a level where speed increases are only slightly noticeable, the bottleneck in getting things done often comes down to the speed of your Internet connection. Local organizations, including the Chamber, continue to focus on this issue. There is widespread agreement about the importance of improving rural access. Several vendors offer high speed internet services to portions of Bedford County. If you live within the service area, plans are very affordable. The challenge for Bedford County and other rural areas continues to be expanding the service to be available at more locations.